Mustache-Benz boss Dr. Dieter Zetsche has been quoted saying a Mercedes-Maybach SUV is "most likely!" Logic dictates that would basically be a GL, soon to be rebadged as GLS, with a bit of a body stretch and a private-jet interior. Subtle, quick, and decadently comfortable. 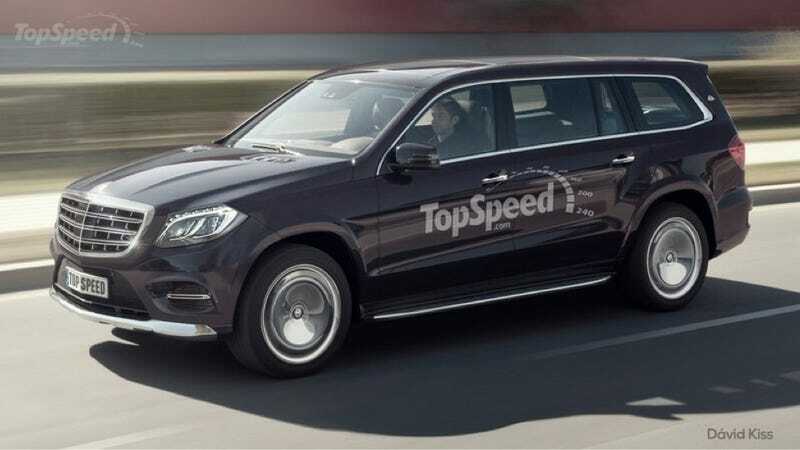 TopSpeed has cooked up this elegant render to provide what I reckon is probably an accurate preview. They seem to think this Mercedes could go as hot as a "GLS600" model with a twin-turbo V12 to rival the Bentley Bentayga as the next dune-busting darling of Arabian oil barons. With a GL63 AMG already starting around $120,000, I think a Maybach version would shoot straight past $150,000 easily. Hell, a top of the line long-wheelbase Range Rover already rings up at $140,000 and Maybach is meant to be a cut-above something so pedestrian.